Indy Quarter Scale Racers: Herzog beats a full field of Sportsman, Chris Stump notches his first win of the season, and Holloway doubles up! 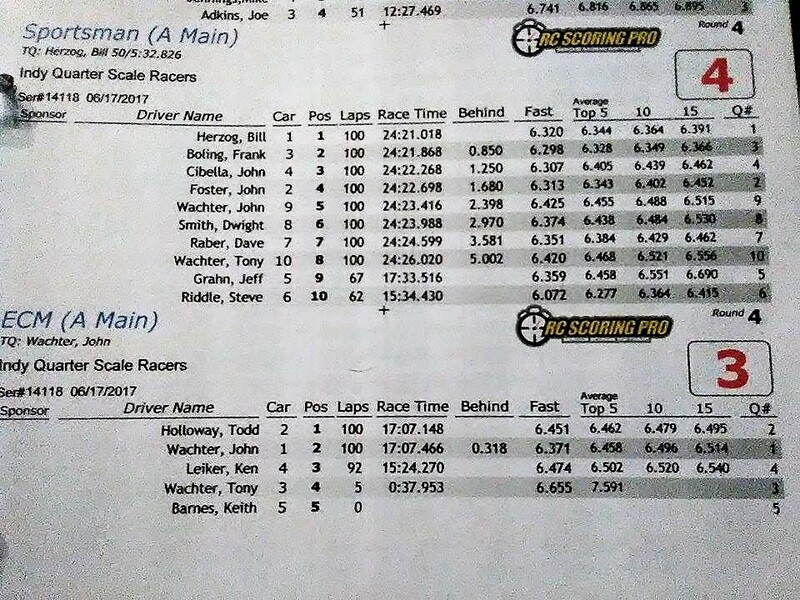 Herzog beats a full field of Sportsman, Chris Stump notches his first win of the season, and Holloway doubles up! 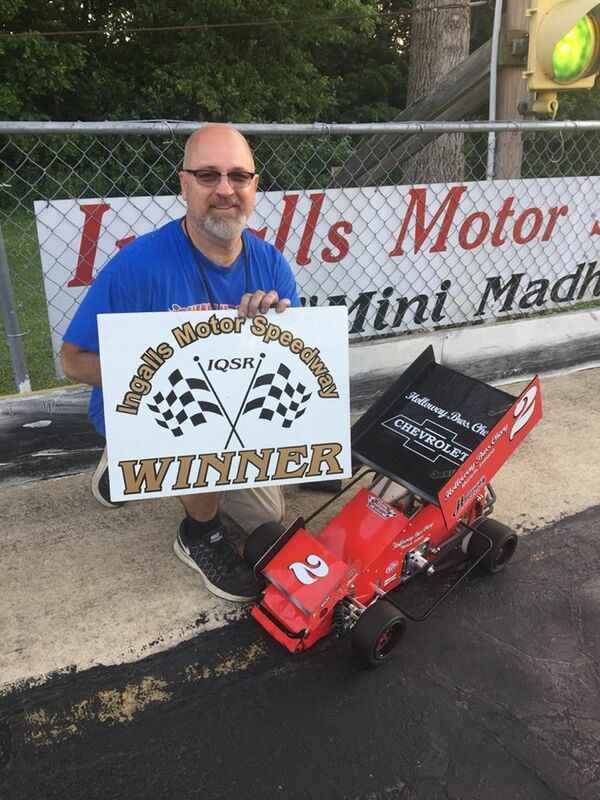 25 total entries in 4 divisions for the first night race of the season at IQSR on June 17th. We had a brief rain shower during the heat races and that set us back a few hours. Thanks to all the IQSR club members for getting the track dry and in great shape for the A Mains. We had a field of 6 Sprint Cars battling for the win. 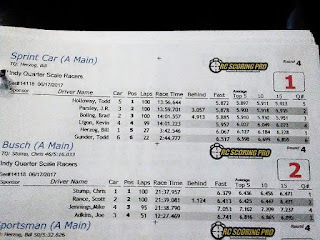 J.R. Parsley was top qualifier with a fast lap of 5.77 to get the 5 point bonus. Bill Herzog swept the heat race wins and started on the pole for the main. He led the early laps of the A Main until he spun trying to pass a lapped car and handed the lead over to Parsley. Todd Holloway was able to pass Parsley and hold on for the win. 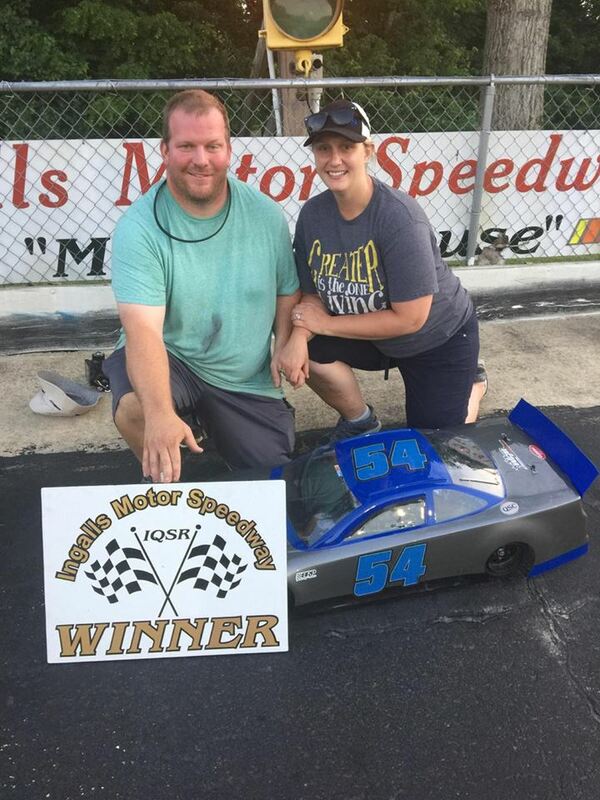 Parsley was 2nd, Brad Boling took 3rd, Kevin Ligon 4th, Herzog 5th, and Todd Gunder finished 6th. 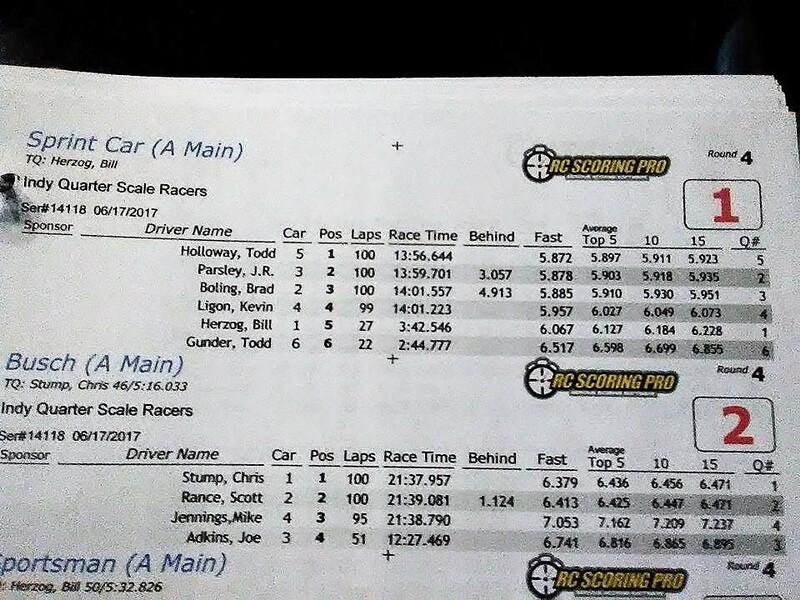 We had 4 Limited Sportsman competing for a victory, Chris Stump and Scott Rance split the wins in the heats. Stump started on the point for the feature due to a faster qualifying time. Stump and Rance went 100 laps nose to tail, it was some of the cleanest and best racing of the day. 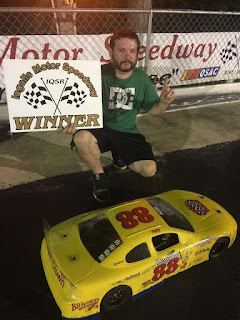 Stump took the victory, Rance was 2nd, Mike Jennings took 3rd and newcomer Joe Adkins had to settle for 4th with a DNF. We had 5 entries in the ECM class trying for a "Madhouse" win. John Wachter started on the pole for the A Main and led the first few laps. Todd Holloway took over the lead on lap 13 and never looked back for the win. 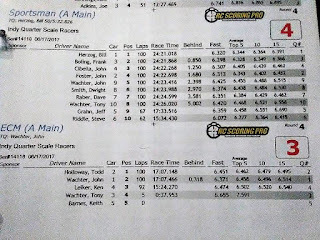 John Wachter held on for 2nd, Ken Leiker was 3rd, Tony Wachter had to settle for 4th with a DNF, and Keith Barnes took 5th and did not start. The Sportsman division had 10 entries and every racer in the field was very fast and had a chance to take the victory. Bill Herzog was on the pole for the Feature race and led the field of 10 under the lights. 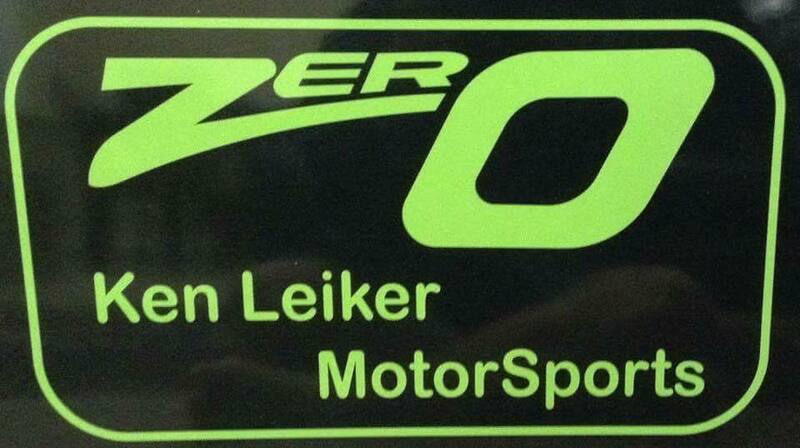 Herzog drove a mistake free 100 laps and fielded off multiple challengers to lead every lap to take the victory. 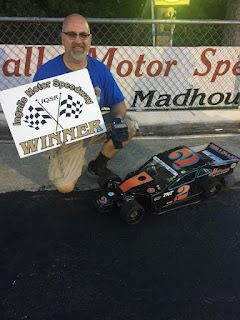 Frank Boling finished in 2nd place, John Cibella took 3rd, John Foster was 4th, John Wacther 5th, Dwight Smith 6th, Dave Raber 7th, Tony Wachter 8th, Jeff Grahn with a DNF for 9th along with Steve Riddle for 10th.